It’s officially spring, and naturally we begin to look forward to getting out of the house and enjoying some outdoor living, making the best of the delightfully variable British weather. 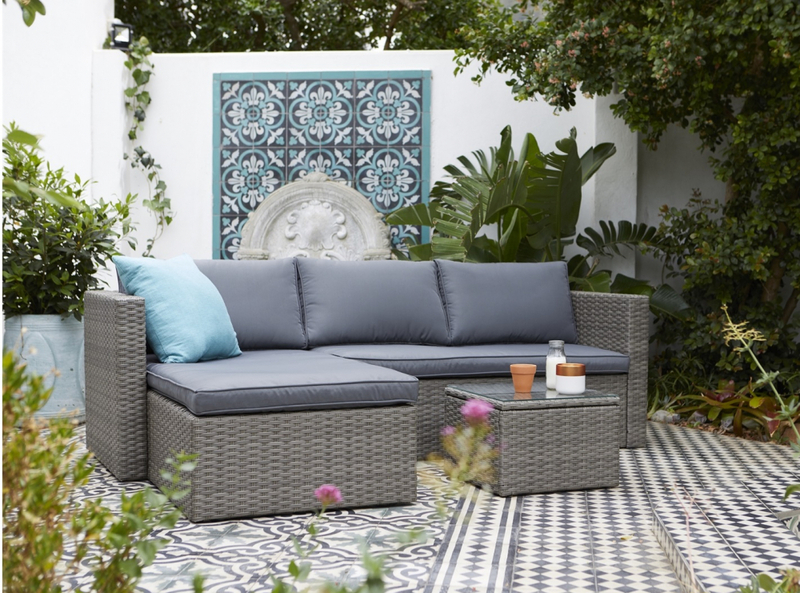 Picnics are good, as are countryside walks, but it’s hard to beat an evening (or a whole weekend) spent in your own garden: family and friends, fun and relaxation, food and drink… so it’s definitely time to check if your outdoor furniture is up to its task. Perhaps it just needs a quick clean? A coat of oil? Or does it need upgrading and updating? If you need a completely new set of patio and garden furniture, are considering updating what you have, today’s guide will help you choose the most suitable materials. Wood is the most traditional choice and when purpose-made for outdoor use, will fit perfectly into all kinds of garden and patio designs. Well-made wooden garden furniture is durable, strong and will stand up to wind. It also doesn’t get hot in the sun, and is often sustainable and environmentally-friendly (though don’t forget the transport impact if the furniture is produced in the Far East, for example). Wooden outdoor furniture tends to be on a heavier side, so harder to move around, and is less likely to fold or stack for storage. With a bit of regular maintenance, wooden outdoor furniture it will provide many years of service – but you definitely will have to maintain it. An annual coat of stain or oil is necessary to ensure a long life. Metal furniture shares some of the advantages of wood: it’s durable, strong and hard-wearing. Modern metal furniture is also surprisingly light (unless you opt for traditional styles and materials like wrought iron, which emphasise solidity and weight) and often folds for storage or can be stacked. One of the biggest advantages of metal is its extremely low maintenance. Rust used to be a problem, but most modern metal outdoor furniture items are made of rust-resistant metals or/and protected against rust. Metal is a flexible material, and thus many designs, from sleek and modern to traditionally intricate, are available. Great choice if you are on a budget but still looking for reliable, serviceable items. Plastic is cheap – even the more expensive plastic will be cheaper than equivalents in timber or metal -- and it is very low maintenance and resistant to the weather. It will not rust or rot (though if you protect it from sun when not in use, it will last longer) and it is lightweight, easy to move and easy to store. Natural rattan comes from tropical palm trees, and is a lovely choice for conservatory and light indoor furniture. Synthetic rattan successfully mimics the appearance of that material, while retaining many of the advantages of plastic furniture. The weave is made of resin woven around a cast aluminium frame, which makes the resulting furniture more solid and stable. It is easy to clean (might need vacuuming now and then) and resistant to weather (sun and rain)– so it can be left outside without worrying too much about the impact of the elements.